Looking for deals in Krakow? Located in Kraków, 0.9 mi from Schindler Factory Museum, INX Design Hotel has a fitness center and a shared lounge. This 4-star hotel offers a 24-hour front desk and an ATM. It's location is very convenient, quite close the market square, and sited right into the Jewish quarter. The staff is very kind, the breakfast is great and the rooms are very comfy. Located in central Kraków, the 4-star Grand Ascot Hotel is just 1969 feet from the Main Market Square and within short walking distance from multiple landmarks and other attractions of the Kraków Old... Very cozy and modern room with comfortable bad. Very tasty breakfast. Hotel Imperial is located by the Main Market Square in the Old Town district in Kraków. Guests can enjoy the on-site restaurant. Every room at this hotel comes with a flat-screen TV. Great rooms and great service. Staff were very helpful. Night manager was very helpful. Bfast staff was great. The modern and stylish PURO Kraków Stare Miasto is located just 0.6 mi away from the beautiful Main Market Square. It offers accommodations with air-conditioning and free Wi-Fi. Everything was great including the restaurant. Ewalina the server was the best . Located in the heart of old Krakow, Hotel Wit Stwosz is just a 2-minute walk from the Main Market Square. It offers elegant rooms with free wired and Wi-Fi internet and satellite TV. . Great location. Nice look. Nice place for breakfast with enough options. Great and polite service. The 4-star Hotel Polski is located just opposite the St. Florian’s Gate, 4 minutes’ walk from the Main Market Square. It offers spacious rooms and luxury suites with free WiFi. Wonderful hotel, great staff, great food, and terrific location. Located in the heart of the Old Town, just a 3-minute walk from Kraków’s Main Market Square, the 3-star Hotel Elektor offers spacious, well-equipped rooms with a flat-screen TV and a tea/coffee maker.... The hotel staff members were really friendly and helpful in everyway they possibly could ! Hotel Unicus is a modern boutique property located in Kraków’s Old Town, just 689 feet from the Main Market Square. All air-conditioned rooms are beautifully designed and strictly nonsmoking. We were moved to the Unicus Palace and treated very well. A beautiful new hotel. Conveniently located 1640 feet from Wawel Royal Castle and 0.6 mi from Krakow’s Main Market Square and Old Town, Hotel Benefis offers free Wi-Fi and a flat-screen TV. Room was excellent, breakfast was great. Staff very helpful! Conveniently located just a 5-minute walk from Kraków Balice Airport, this 4-star hotel features a restaurant and a bar. Luggage storage and WiFi are available free of charge. Excellent accommodations! The breakfast is great and the staff is very kind! The Hotel Jan is in a 600 year old townhouse in the very center of the Krakow Old Town, 325 ft from the Main Market Square. It has a 24-hour front desk and air-conditioned rooms with free Wi-Fi. One of our rooms had a lovely balcony and was very roomy. The other one was very small. Located right by Kraków’s historical Jewish Quarter of Kazimierz, Metropolitan Boutique Hotel is less than 0.6 mi from the Old Town and the Wawel Royal Castle. Room was spacious, everything updated, nice buffet breakfast. The Columbus Hotel is in Krakow’s Kazimierz District, just 320 yards from the Tempel (Temple) Synagogue. It provides air-conditioned rooms with free internet access. Go to the Indian restaurant across the road, it’s amazing. The 3-star Hotel Wielopole is located 5 minutes’ walk from Kraków’s Main Market Square. Its rooms offer a fridge, tea/coffee facilities and free WiFi. In the morning a varied breakfast is served. All was great specially the people on the reception. Ideally located between Krakow's Main Market Square and Kazimierz is this charming hotel is housed within a castle complex. Hotel Pugetow offers an oasis of calm directly in the center of Krakow. Great staff and breakfast was very good. Hotel Indigo Krakow - Old Town, a part of the InterContinental chain, is a boutique hotel located in a historic building, built in 1836 in the heart of Kraków. Lovely hotel with amazing interiors. Staff very friendly and helpful. One of the best. Venetian House Market Square Aparthotel is located directly the Main Market of Kraków’s Old Town. Located on the beautiful main square of Zamosc, the bedrooms were spacious, stylish and comfortable. Overlooking the 17th century Church of St Peter and Paul, Hotel Senacki is located in Kraków’s Royal Route. It offers classic rooms with satellite TV and free internet access. Breakfast was excellent, the staff very attentive, location couldn't be better. Located 1640 feet from Wawel Royal Castle and 2297 feet from the Market Square in Kraków, Hotel 32 Kraków Old Town offers a sauna and free WiFi. Good location and very clean. The staff were very friendly and helpful. The food was good. Wentzl is a historical hotel, housed in a 15th-century tenement on the Main Market Square in Kraków. It offers luxurious rooms with unforgettable views of the Old Town and free Wi-Fi. Location, location. Centre off oldtown on the square. Hotel Amber is located in Kraków’s Old Town, a 6-minute walk from the Main Market Square. It offers rooms with a flat-screen TV and with free high-speed Wi-Fi. We found everyone to be both friendly and helpful. Perfect, quiet location near the Old Town. How much does it cost to stay in a hotel in Krakow? On average, 3-star hotels in Krakow cost $62 per night, and 4-star hotels in Krakow are $96 per night. If you're looking for something really special, a 5-star hotel in Krakow can be found for $146 per night, on average (based on Booking.com prices). Which neighborhood is the best one to stay at in Krakow? Old Town, Grzegórzki, and Pradnik Czerwony are popular with other travelers visiting Krakow. Which hotels in Krakow offer an especially good breakfast? 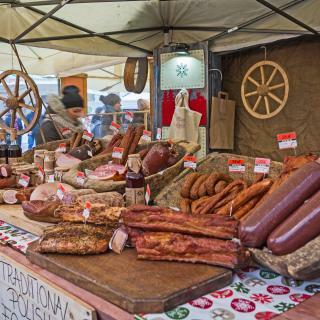 For hotels in Krakow that serve highly-rated breakfasts, try Hotel Wit Stwosz, PURO Kraków Kazimierz, and Hotel Legend. Which hotels in Krakow are good for couples? These hotels in Krakow are highly rated by couples: Metropolitan Boutique Hotel, PURO Kraków Kazimierz, and Grand Ascot Hotel. How much is a hotel in Krakow for this weekend? The average price per night for a 3-star hotel in Krakow this weekend is $115 or, for a 4-star hotel, $160. Looking for something even fancier? 5-star hotels in Krakow for this weekend cost around $324 per night, on average (based on Booking.com prices). What are the best hotels in Krakow near Main Market Square? Some of the best hotels in Krakow near Main Market Square include Bentis Luxury Apartments, Downtown Apartments Cracow and Saint Thomas Apartment. How much is a hotel in Krakow for tonight? On average, it costs $55 per night to book a 3-star hotel in Krakow for tonight. You'll pay around $79 if you choose to stay in a 4-star hotel tonight, while a 5-star hotel in Krakow will cost around $127, on average (based on Booking.com prices). Which hotels in Krakow have nice views? Q Hotel Plus Kraków, Benefis Boutique Hotel, and Hotel Columbus got great room view-related reviews from travelers in Krakow. What are the best hotels in Krakow near John Paul II International Airport Kraków–Balice? Travelers who stayed in Krakow near John Paul II International Airport Kraków–Balice (KRK) have said good things about Hilton Garden Inn Krakow Airport, Hotel Pod Kamykiem, and Hotel Polin***. Which hotels in Krakow are good for families? Many families visiting Krakow loved staying at PURO Kraków Kazimierz, Hotel Pugetow, and Hotel Senacki. Which hotels are the best ones to stay at in Krakow? PURO Kraków Kazimierz, Metropolitan Boutique Hotel, and Hotel Legend are some of the popular hotels in Krakow. Poland’s jewel and its most popular tourist destination, Kraków, features many medieval, Renaissance and Baroque architectural examples. Its entire Old Town is a World Heritage Site and the rest of the city has even more to offer. The beautiful Royal Coronation Route, traversed in the past by the Kings of Poland, allows you to see the stunning Cloth Hall, standing proudly at the Main Market Square, the 15th-century Barbican, and St. Mary’s Basilica with the world’s largest Gothic altarpiece and the amazing Wawel Castle. 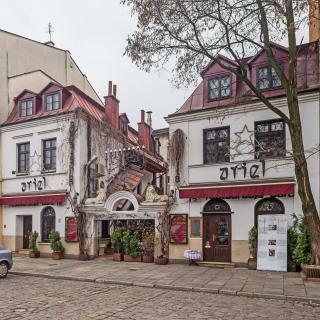 The picturesque streets of the Kazimierz district have Jewish-themed restaurants, bookstores and small shops. Stylish cafés can be found all over the city and trendy restaurants serve delicious polish cuisine. Upscale bars and exciting clubs are the center of Krakow’s vibrant nightlife. If you want to get away for a day, make sure you see the stunning Wieliczka Salt Mine, built in the 13th century and featuring an entire altar carved out of rock salt! Or breathe some fresh air in Poland’s highest mountains, the Tatras, just a short drive from Kraków. Catch a train from Balice International Airport and start exploring Kraków immediately. From luxury hotels, to comfortable apartments, to budget hostels, Booking.com has great accommodations for any Kraków vacation. The old city was easy to navigate, full of old world charm, wonderful architecture, fabulous churches (and so many of them, it was amazing). For a major city, this was a very inexpensive place to visit; transportation, food and lodging all very reasonably priced. Lots of restaurants to chose from, everything from Polish to Italian to French to American. Enjoyed visiting the salt mine with its sculptures in salt. rooms like a grand cathedral and displays showing how salt has been extracted over the centuries-surprisingly interesting. Krakow is a beautiful city with good museums and much to see. The hotel we stayed in, the Metropolitan Boutique Hotel, was splendid. Truly first class, at about 1/3 what one would expect to pay for this level of quality and service. That was true of just about everything in Krakow: far better than expected at a fraction of the price one expects. Krakow provided an altogether wonderful experience at vastly less than a New Yorker like me would expect to pay. Beautiful, historic city! There are so many sights and stops to experience just within the Old Town, but then one should also reserve time for day trip destinations. Do NOT miss the salt mines at Wieliczka; a truly wondrous place. In Old Town there are family run restaurants called "bars" which serve simple, delicious food. For a nicer dinner our family loved Hotel Polonia's restaurant dining room. We dined there several times and the food was consistently tasty and appealing in presentation. We will be back! We loved the historical stops like the Wawel Castle, Kazimierz District and Cloth Hall. Our hotel prepared a delicious gourmet Christmas dinner for us (Hotel Polonia) but we also enjoyed dinner at a "milk bar," one of many in the Old Town with traditional Polish fare. Once we got the knack of the streetcars, they were an economical way to traverse the whole city. Taxis were a bit more pricy but not out of the question, especially with luggage in tow. Beautiful, historic Old Town was our favorite. Can't wait to return. Krakow was a very pleasant surprise for us. We stayed in Krakow as a base to visit Auschwitz but it has a beautiful Old Town (Stare Miasto) and we could have spent much more time exploring it's sites. The access to the Old Town by car and parking was much easier than we found in other cities. Our hotel provided a very pleasant experience and we enjoyed an excellent meal at a nearby restaurant. We were surprised to learn that Oscar Schindler's factory was nearby and is now a museum which we visited. I think we would have enjoyed spending a few more days in Krakow. I reccomend visiting the café oranżeria - we haven't eaten, only ha a drink, but enjoyed the amazing view of Wawel (the staff wastn't too nice though). Also ate in the restaurant Pod Wawelem - staff very busy, but that is easily compensated by the food, atmosphere and prices, which are unbelievable considering the location! We have also visited the christmas markets - amazing smelling food everywhere! 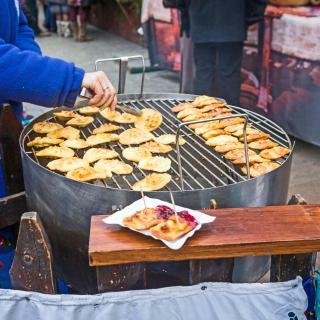 The best part of it are Oscypki (grilled cheese) z żurawiną / z śliwką i boczkiem (with cranberry sauce and bacon), which are simply out of this world! Just make sure to buy your mulled wine on your way there, the lines are unbelievable. The nicest thing about Krakow is, that you can easily get around the centre walking. Leave your car at the hotel. That way you can easily soak in the atmosphere an the feeling o the city. great location, with a wonderful breakfast! The hostel is located right on the big main square. No public transportation access, but totally worth it! Just a few minutes walk to the old town, but the center is right next to the place. Rooms are big and fully equipped with outlets, lights and lockers. Also, safes are available. Very good kitchen, if you want to make something fr yourself. Breakfast is the best I ever had in a hostel! Very good for the price. Spacious, a stone’s throw from the main square, and easy access with key codes. The place is pretty modern, well equipped, and you get a cool view from The back balcony of the tops of the churches. Check in is easy since there is a desk for the apartments. We had our 3 year old daughter and she enjoyed having her own big girl sofa bed. Use a taxi to get here, NOT Uber since they can’t drive close to old town. Very clean appartment, perfectly located near city centre, all within walking distance. Most kind reception by the owner. Good beds, perfect for us. (2 adults and one child 16 yrs). Shower and (small) kitchen very clean, modern and comfortable. 5*! Fine restaurant nearby: although a little bit hidden: OD JAJKA DO JABŁKA, near Best Western Hotel, few 100 meters from apt. Beautiful little apartment block in a street just off the Krakow old town. Everything you need close by - supermarkets, places to eat. High ceilings, big rooms, quiet, a great outlook onto a tree-lined street. A short walk to everywhere, including the main station. There's not much else you need in a hotel. I'd definitely stay again. Great apartment. 5 minutes walk into the centre of the Old Town. And 5 minutes walk to the castle and river. Great location.. The apartment itself is very nice, modern and spacious. For a studio it's bigger than most one bedroom apartments I've stayed in.. Been in krakow many times and this by far is the best overall. The staff were incredibly friendly and helpful. The hotel is out of the city centre and more towards a residential area so the noise outside was minimal. Even though it is out of the centre, there is a tram stop at the bottom of the street and it's only 6 stops from the old town which takes roughly 10 minutes. Amazing hotel in the old town of Krakow. All is done there with love and rooms are decorated in a baroque style. Hotel is directly opposite of the old city wall and just 7 minutes away from Krakow Glowny (Main Station). Everything very clean and new as well. You should enjoy your stay in Krakow there. Great location (3 min walk from the main square) . Very clean and comfortable and for a great price. The shower was amazing! (Even though we run out of hot water) Every one that complains about having no elevator, it's an old building it's to be expected in the old town centre. The location is fantastic, less than 5 minutes walk from the main square in the old town. Great facilities inside the apartment, kettle, hair dryer, iron, fridge etc. Very comfortable and clean. Prompt and effective communication from staff. Would return without hesitation. It was very lovely and perfect for visiting the city by car(parking lot inside,very comfortable). excellent breakfast,you can enjoy your coffee in the garden!even the hotel is outside the city centre,you'll get the best for lower budget! Staff was friendly and helpful. Location was in easy walking distance of the main square in Old Town, with lots of restaurants nearby. Complimentary breakfast was fresh and well stocked with a variety of local tastes. Great value. New hotel, all very clean, free parking available, with very democratic price, and just 35 minutes to walk to the old town. Next time in Krakow I am planning to stay in Aparthotel Friendhouse again. Really cheap nice hotel. It takes 15 minutes to get to the city centre by car. Bed was comfortable. Really really nice bathroom for this place. Breakfast was ok. Parking on site. The hotel is 15 minutes (by car) away from Krakow city centre and close to the airport. We liked the hotel, it has a big family room which was perfect. The breakfast was good. the location is just beside the Main Square in old town, you can be very easy to walk around the centre, cheap and clean, the staff are all friendly! The Place was located in a very nice area of Krakow really in between both best areas Jewish Area and the Old Town.